Lange Grinding, Inc. had spent most of their 30 years in business succeeding as a dedicated grinding powerhouse. Their 40,000 sq. ft. Ohio facility, home to 17 specialized grinding machines, is known across North America for their high level of craftmanship. Serving customers from the United States and Canada specializing in large Blanchard and surface grinding, Lange wanted to expand their single process view of parts and take sole custody for the multi-step machining processes involved. As a determined family-owned and operated business, evolution towards becoming a multi-faceted shop was the obvious next step. “Our ah-ha moment took us realizing that we didn’t always know the result of these parts.” Often, contract manufacturing shops are only seeing a fraction of the machining required prior to final assembly. “We thought, why not offer customers the opportunity to have all their work done here and save them the cost and hassle of trucking,” said Adam Lange. 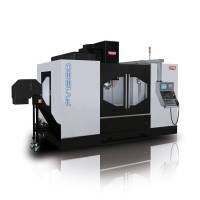 Lange’s first purchase outside of their traditional core competency of grinding was a large boring mill, fit to complement the large component capabilities of their existing grinding equipment. The positive customer response to the new single source solution led Lange to seek out the next process integration opportunity. A solution was needed for milling of AR500 and AR400 steel armor plates as well as other small-mid range tight tolerance parts. Enter Toyoda’s FV1680, geared head boxway vertical machining center. “The horsepower and torque and the shear rigidity of the machine was impressive,” said Lange. “The learning curve was steep, but as a grinding-focused shop, we knew that and took things slow. A majority of our work is with armor plate, so the ability to produce a quality part weighs of higher importance than rushing through high speeds with potential to sacrifice quality and the Toyoda has performed outstanding with what we’ve thrown at it”.